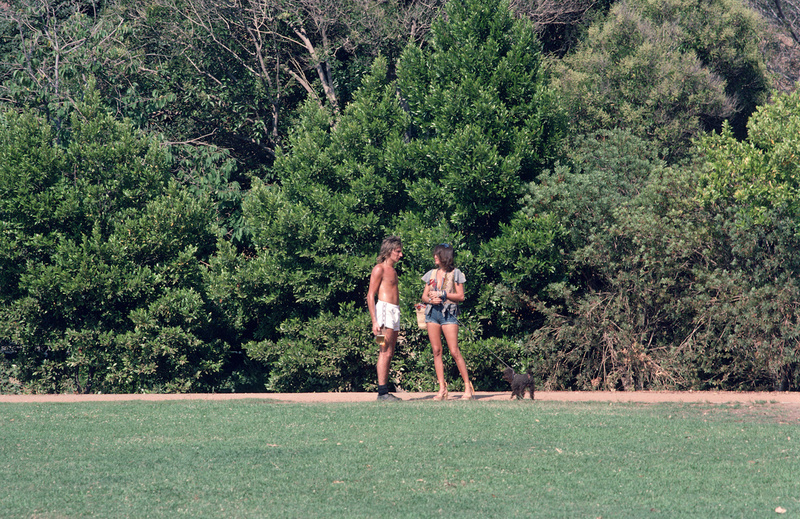 If you were in-crowd or involved in the music industry around 1976 you knew that Rod Stewart played soccer every Saturday at the Coldwater Canyon park in Beverly Hills. He was nuts about his game. I showed up every weekend with a long lens and I shot away. Rod never seemed to care. I would dash off to the color lab; then the next day on to the post office to mail my color slides to the teen publications in London. They purchased them all and demanded more. Photos of Rod kicking a ball can get a bit mundane after while; but if you wanted to make the real dough, you needed to get Rod with a girl. This photo is just what the London Daily Mirror wanted. Not only did they love the chick in the photo, but the icing on the cake was Rod with his pint of beer in hand! That is what made this photo! During these magical days at the Coldwater Canyon park, not once did anyone say No Photos nor did another photographer ever appear. Today, it would be total bedlam to photograph a star of Rod’s magnitude in a public park. The last time I drove by the park the soccer field was gone and the Department Of Water & Power had taken over the property. I will always have these wonderful memories of Rod, the soccer field, and that chick with the endless legs!